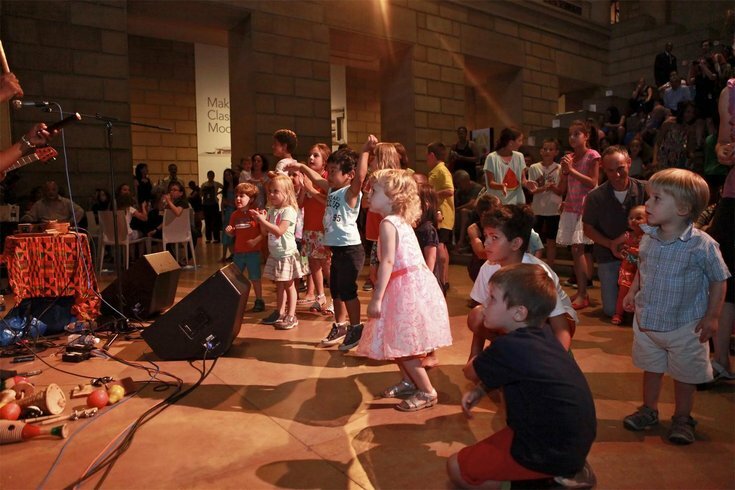 Now in its third year, Philadelphia Museum of Art's child-centric summer programming ArtSplash begins Tuesday, June 30. The Museum will host a slew of family-friendly events and activities, marking it as a space for creative play all summer (especially since children under 12 are always free). Each day through Monday, Sept. 7, the PMA will have a special ArtSplash gallery open that is designed for families. "A is for Art Museum" is inspired by the Museum's book by the same name. In the exhibit, guests will explore artwork by seeking out animals in the "A" section, rivers in the "R" section and trees in the "T" section. Also open through Sept. 7 is the ArtSplash Studio, a studio among the galleries where all ages can create art together. There, guests will also find iPad minis they can borrow equipped with the "A is for Art Museum" app. The app will take them on a self-guided tour of 26 of the Museum's works that correspond with letters of the alphabet. Every day of ArtSplash, interactive family tours will take place at 11 a.m. and 3 p.m. Plus, the Family Art Cart will travel the galleries with hands-on activities from noon to 3 p.m.
ArtSplash also includes two Family Festival Days that are pay-what-you-wish general admission. Sunday, July 5, from 10 a.m. to 5 p.m., a "Rivers & Waterways"-themed day will include art making and performances, as well as two screenings of the animated film "Song of the Sea." Sunday, Aug. 2, from 10 a.m. to 5 p.m., "The Great Outdoors" will take over with two performances by Grammy-winning duo The Okee Dokee Brothers. The Museum will also offer stroller tours, interactive book readings and creative family workshops throughout ArtSplash. Click here for the full lineup.